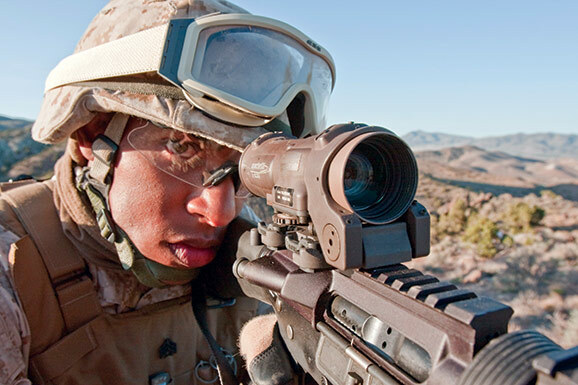 Reducing the size, weight and power requirements of optical rifle sights provides increased capability while reducing the burden on the warfighter. SWaP (Size, Weight and Power) has become a critical evaluation and selection methodology as militaries implement soldier modernization strategies globally. In the ultra-competitive defense industry, customers expect companies to consider SWAP-C (including cost) not only to win new contracts, but also throughout the entire product life cycle. This concept is integral to ongoing product development at Raytheon ELCAN Optical Technologies. 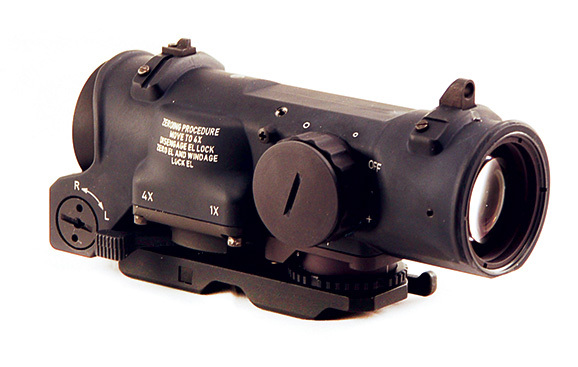 In 2009, ELCAN introduced the Specter OS4x fixed magnification lightweight day sight (designated FIST LDS) for the UK MoD FIST program. The LDS sight was a spiral development that utilizes the superior 4x-magnification optics and mechanics of the SpecterDR 1-4x dual role weapon sight and reduced the weight burden on the warfighter by 17%, weighing in at 528 g.
ELCAN Specter® DR 1-4x dual role weapon sight. © Raytheon ELCAN. Using the SWAP-C concept, Raytheon ELCAN has recently introduced simple changes to its ELCAN Specter line of combat optics (specifically the ELCAN Specter DR 1-4x and 1.5-6x dual role weapon sights and the Specter OS4x fixed magnification sight) that will positively affect the war fighter while maintaining the legacy of ruggedness, reliability as well as amazingly bright and accurate optics. This latest round of changes incorporates a new and improved, low profile illumination switch located on the left side of the sight body. At first glance, there doesn’t appear to be much difference in the design – the SWAP-C improvements are evident in the benefits to the warfighter. SIZE: The original illumination switch stuck out 26.8mm from the sight body. This increased the risk of damage and battery cap loss. The new, lower profile switch reduces this burden by half and protrudes only 14.9mm from the sight body. This greatly reduces risk of damage to the optic as well as the probability of it getting hung up on equipment during operator engagement. WEIGHT: The new low profile illumination switch along with strategic material substitutions provides a 5% reduction in the overall weight of the optic, reducing the weight of the ELCAN Specter DR 1-4x sight from 640 grams to 607 grams in addition to a reduced requirement to carry additional batteries. POWER: The incorporation of the DL2032 lithium battery to replace the DL1/3N battery provides a 50% increase in battery life. At the average setting, the DL 1/3N battery gave the user about 3,000 hours of power; the DL2032 provides approximately 4,500 hours of battery life at average setting. COST: Integrating the SWaP-C concept into product development continues to reduce the total cost of ownership for our customers over the life of the optic with reduced damage, longer battery life and incorporation of a lower cost battery. ELCAN’s next spiral development leverages the optics and mechanics of the Specter DR 1.5-6x dual role sight and the new low profile illumination switch. The ELCAN Specter OS6x fixed magnification sight is designed to provide a minimum weight reduction of 10% and is scheduled for release in early 2017.